The beloved Bicycle Wedding Cake Topper is BACK! This very popular wedding cake topper is now IN STOCK at fancyflours.com. I know there are many brides out there that have been searching high and low for this charming topper. I thought I would let you all know that it is now available! It would make a lovely addition to any wedding cake. It is handmade in France in enamel over bronze with a happy bride and groom riding tandem–plus a small white dog in the bicycle basket. A true heirloom piece. It is dainty in size, measuring approximately 2.5″ in height. If you like what you see- Order NOW as this item goes fast! In addition- check out the complete Fancy Flours Vintage Wedding Cake Topper collection at www.fancyflours.com. There you will find vintage toppers ranging from the 1920’s to more contemporary pieces. To all collectors and brides-to-be…ENJOY! 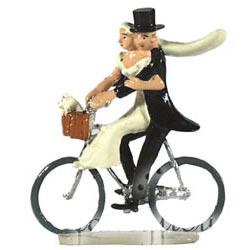 Pingback: The beloved Bicycle Wedding Cake Topper is BACK! Please advise if this is in stock and the costs involved. Yes this item is in stock. Thank you for your inquiry. It is $95.00 and is available to ship. However we are closed from Dec. 24-28 and Jan.1.